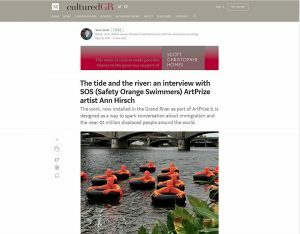 (SOS) Safety Orange Swimmers featured in Public Art Review! 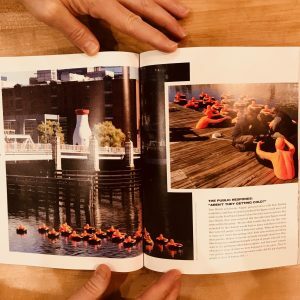 Forecast Public Art and @publicartreview are featuring SOS (Safety Orange Swimmers) by my collaborative project @anjartndesign in PAR’s 40th anniversary issue which we just received! 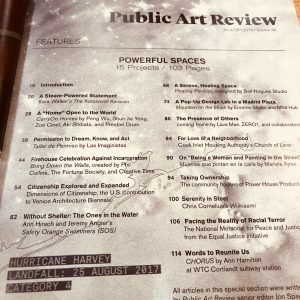 SOS is included in a survey called “Powerful Spaces; 15 Projects / 103” on the future of public art. 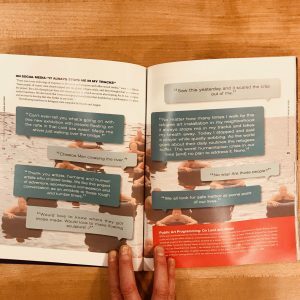 You can order your copy of this special edition here and read interviews with artists at the leading edge of community-engaged design and much more! 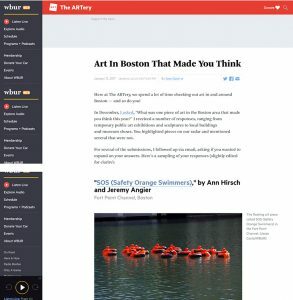 Special thanks go to @fortpointarts and @friendsoffortpointchannel for commissioning #SOSSwimmers! Readers often tell us that they love our “Projects We Love” department, so we began this issue with the simple idea to add more pages and fill them almost entirely with inspiring works. 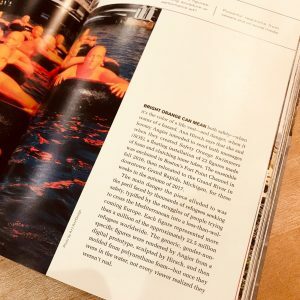 A theme emerged early in our process; the editorial team was drawn to the work of artists and designers using their unique ability as creative visionaries, problem-solvers, and meaning-makers to create powerful and timely spaces. 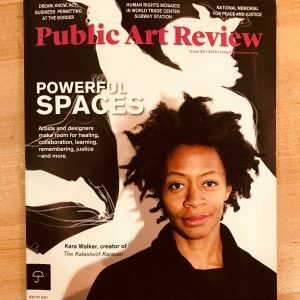 Over 103 pages devoted exclusively to 15 projects—whether in Alabama or Alaska, Brownsville or Boston, Buenos Aires or Madrid—you’ll discover how artists and designers created 15 public art and creative placemaking projects that connect us to our shared humanity. 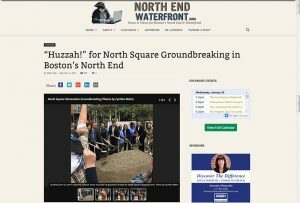 A+J Art+Design break ground on the North Square project with Mayor Marty Walsh, community members of the North End and the Mayor’s Office of Arts and Culture. 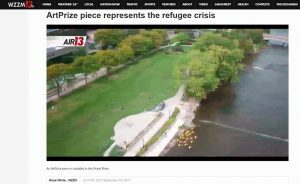 GRAND RAPIDS, MICH. – There is an ArtPrize installation piece in the Grand River that represents the refugee crisis. 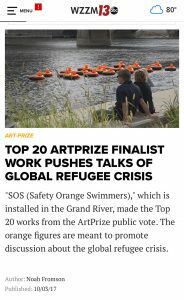 The piece is called SOS, or Safety Orange Swimmers, and it makes a connection between the Grand River and all the rivers and seas that people have crossed in search of safety and shelter. 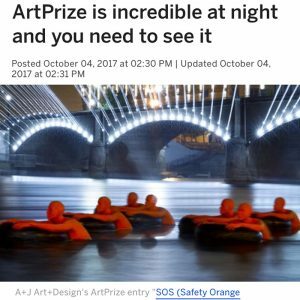 A+J Art and Design, a collaborative team based in Boston, are one of the recipients of the ArtPrize Featured Public Projects grants this year. Ann Hirsch and Jeremy Angier’s project will be one of two entries in the Grand River. 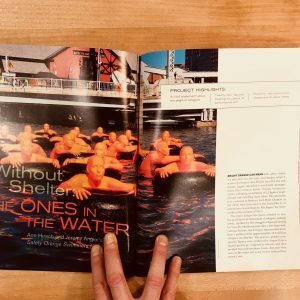 As a way to highlight some of the stories behind the development of the dozens of projects that received grants this year, I decided to mail a small questionnaire to artists that we could then publish on the ArtPrize Blog. 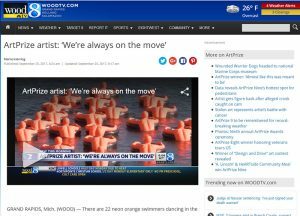 Ann and Jeremy responded by asking if we could have a longer conversation about their work and the shifting realities of immigration, which their work explores, as well as the political forces challenging the country — and even ArtPrize itself. I happily agreed. For context, it’s relevant to note that we spoke on September 6, 2017, the day after Attorney General Jeff Sessions announced that DACA would be rescinded, and in between Hurricanes Harvey and Irma. The conversation has been edited for length and clarity. 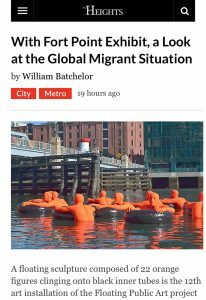 This temporary exhibition in Boston’s Fort Point Channel called attention to today’s refugee crisis. Each figure represented nearly 1 million of the United Nations’ estimated 21.3 million refugees in the world today, as we previously reported. 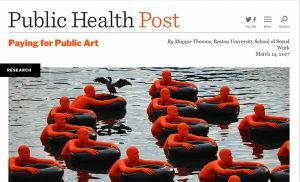 “Onlookers at Fort Point stop to admire and make sense of the eye-catching figures. The uniform shapes are painted “safety orange” for good reason. From an artistic standpoint, it was important for the artists to choose a bright color they knew would make a big impression on observers.